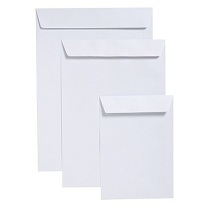 Quality Plain White (Cartridge) pocket envelopes for those larger documents. Choice of envelopes with Self Seal and Strip Seal options in a range of the most popular sizes. 'Pocket' means envelopes that open along the 'short' edge. 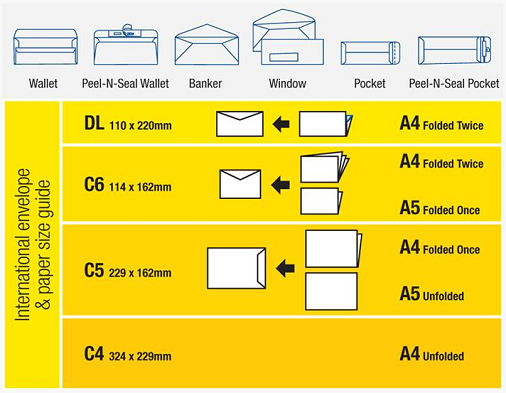 The most popular C4 envelope size takes a sheet of unfolded A4 paper. Convenient pack of Premium White C5 Heavyweight Pocket Envelopes. Pack of 50 pocket style envelopes. Heavyweight 100gsm White Cartridge. Convenient pack of Premium White C4 Heavyweight Pocket Envelopes. Pack of 50 pocket style envelopes - Heavyweight 100gsm White Cartridge. Bulk box of C5 Plainface Peel and Seal White Heavyweight Envelopes. Box of 500 pocket style envelopes. White Heavyweight. White Heavyweight Pocket Envelopes for unfolded A4 documents. Box of 250 pocket style envelopes - Heavyweight 100gsm White Cartridge. Heavyweight White Expanding Envelopes are ideal for bulky A4 size documents. Envelope Size: 340 x 229 mm (C4) with expandable 30 mm gusset. Box of 100 pocket style envelopes - Heavyweight 130gsm White Cartridge.